Here's a short interview with Philip Yancey, author of several bestselling books including What's So Amazing about Grace? and his new one What Good is God? He talks about being an "extreme introvert" but says that far harder than the public speaking role are the "30 second conversations with strangers." Also, he has awesome hair. How ironic is this? I went to an event called "Permission to Speak Freely" last night. No one else seems to find that as funny as I do. It was an evening with my friends Anne Jackson, author of Permission to Speak Freely, and Susan Isaacs, author of Angry Conversations with God, and also musician I'm not acquainted with named Solveig. It brings up again the issue of "sharing" that we have addressed on this blog- a sharing which is both freeing and terrifying. Many introverts I know are turned off by the expectations that some churches have that you will share the details of your life with others, especially those you don't know. And I appreciate and emphasize with that, but I also get concerned that the resistance to sharing things with people is a result of fear or past bad experiences, not a natural personality trait. Now, who you choose to share with is the critical issue. There has to be a level of trust present before most people will feel comfortable opening up their lives. But I was reminded again that even the most introverted person needs one or two people in their lives who they can be truly vulnerable with. Hearing someone else say "me too" when we confess something really difficult is one of the most powerful and freeing experiences that we can have. What are your thoughts about "sharing" in churches? What are bad examples you have seen? What are good examples you have experienced? It's hard to believe I've been blogging at Introverted Church for 3 1/2 years, especially considering that 98% of my posts are about introversion and the experience of introverts in the Christian life. Without this blog I doubt that Introverts in the Church would have been published, since that was a major part of my "platform" in my proposal to IVP. And the book certainly wouldn't be selling as well as it is. I'm going to keep posting here about introversion and the Christian life, but I'm also going to expand my repertoire over the next few months. I'm working on a new book now (actually 3 new books) and while I think most of you will resonate with the topic, it's still a little different and will apply equally to extroverts. If I get a book contract then I will be posting regularly about that topic. I keep threatening to write book reviews as well, though I just haven't found the motivation to do that much. As always I remain grateful for all of you and the comments and emails you write. I'm better at responding to emails (and Facebook posts - here's my Introverts in the Church page) than I am responding to comments, but I read and consider every comment. As far as the blogging world goes, you are very civil group of people and I very much appreciate the tone that has been set here. 1. The cover story of the September issue of Psychology Today is called "Revenge of the Introvert" and it's written by Laurie Helgoe, author of Introvert Power. Adam S. McHugh is an ordained Presbyterian minister, a spiritual director, and an introvert. 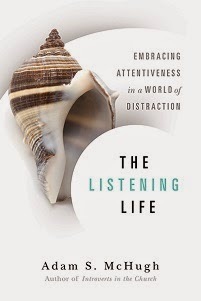 He is the author of Introverts in the Church: Finding Our Place in an Extroverted Culture. He blogs at www.introvertedchurch.com and tweets at @adamsmchugh. He lives with his wife in Claremont, California. See his expert page at Patheos for more information on Adam McHugh and his publications. I preached at Irvine Presbyterian Church in Irvine, CA last weekend. I preached my very first sermon there back in the summer of 1999 (I tried to listen to it recently...it was AWFUL). The direct link to the Mp3 of the sermon is below. The sermon is called The Goals and Perils of Community Life and those of you who have been following this blog before might have already listened to a previous version of it. It's about participation in community life and what our motivations are for doing so. I define introversion and also talk about why being an introvert can sometimes be difficult in church life. I also talk about the value of saying "no". 2. Preach 10:40-11:10 at the 2nd service. Then, immediately walk out of that room and walk over to the other service happening simultaneously, and preach 11:12-11:40. 3. 45 minutes of greeting time and book signing afterwards. Plus, the second service is primarily for youth and young adults, and so it is a completely different cultural dynamic than the other services. Preaching a sermon back to back was exhausting, because during the course of a sermon you ride quite a roller coaster of emotion and you almost never end in the same place emotionally as you began. But then I had to turn around, try to get back to the emotional starting place, and start all over again, with an audience middle-aged and older. It was pretty incredible. Fortunately, the adrenaline was enough to keep me going. When you have a big social task ahead of you, never underestimate the power of adrenaline and caffeine. A few months ago I did an interview with Christianity.com which has recently had another surge in popularity. It's been reprinted on Crosswalk.com and you can follow the link below. It's the most extensive interview I have done on the struggles and gifts of introverts in Christian community. My favorite question they ask is "What qualities of introverts are prone to be overlooked?" Also, I wrote an article for the "On Faith" section of the Washington Post that will be up next week, so stay tuned. I wrote this article for Patheos.com back in June and I thought I would reprint it in full here. Some of you know that in addition to being a Presbyterian minister and writer, I am also a certified spiritual director. In this article I discuss the parallels between spiritual direction and the qualities that introverts bring to the Church. 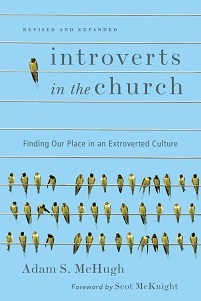 Pastor, popular blogger, and introvert Ron Edmondson is giving away three copies of Introverts in the Church on his blog today. He's also written some helpful posts about thriving in ministry as an introvert, which he links to on the giveaway post. Check it out! I thought I would re-print my article for Patheos.com's "Future of Evangelicalism" series. The title is "Conversations with the Saints."